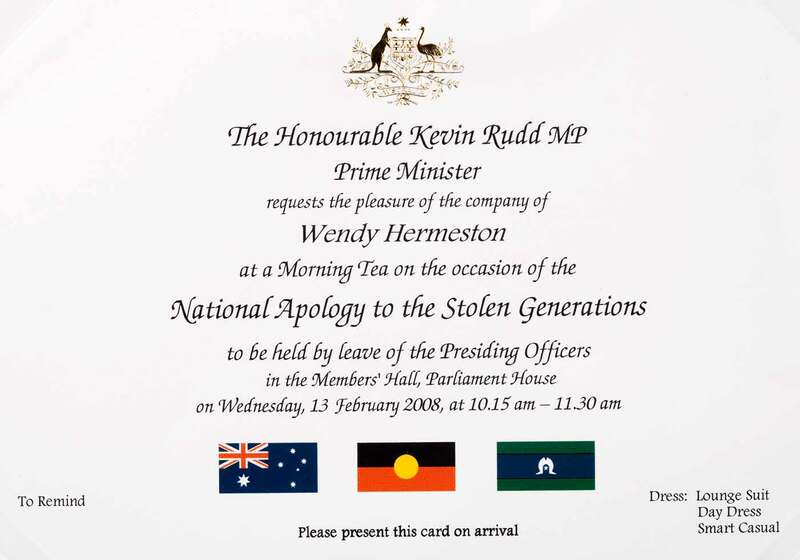 On 13 February 2008, Prime Minister Kevin Rudd made a formal apology to Australia’s Indigenous peoples, particularly to the Stolen Generations whose lives had been blighted by past government policies of forced child removal and Indigenous assimilation. The journey to national apology began with the Bringing Them Home report — the findings of an inquiry instigated by the Human Rights and Equal Opportunity Commission in 1995. This moment had its origins in the Bringing Them Home report. This report tabled the findings and recommendations of the Human Rights and Equal Opportunity Commission inquiry. The inquiry took evidence personally from 535 Indigenous people and received hundreds of letters and testimonies from other people. It also recognised that there were many who could have provided evidence but did not do so because they were unable to travel, uncomfortable with the public nature of the inquiry, or still too frightened or traumatised to speak of their experiences. This last difficulty was perhaps most strongly felt by parents who had lost children and who experienced lifelong grief as well as shame for not being able to protect and keep them. After about 14 years my [eldest] brother came to live with us. One sister found us through the Salvation Army about 16 years later. Then my [baby] brother … who died last year … was caught up in the system, was like a lost street kid and was bashed by the police in Melbourne a couple of years ago. [He] ended up with a tumour on the brain and was never the same again. My second sister … my family didn't see for 27 years. What could anyone do now to make up for those 27 years of not having their sister a part of their life? [It’s] a terrible big hole in my heart that will never be filled. We all are in contact with each other now and we try to make up for all those lost years. But something’s missing. My Mother never gave up trying to locate me. She wrote many letters to the State Welfare Authorities, pleading with them to give her son back. Birthday and Christmas cards were sent care of the Welfare Department. All these letters were shelved. The State Welfare Department treated my Mother like dirt, and with utter contempt, as if she never existed. Based upon multiple stories such as these, the report made 54 recommendations. Recommendations five and six indicated that all governments, police forces, churches and non-government agencies should issue an apology. The Western Australian government was the first state government to act, issuing its apology on 27 May 1997. By 2001, all state and territory governments had issued apologies. Only the Australian Government, under John Howard, demurred. Indigenous people and their supporters began a campaign to spread awareness and build support in the broader Australian community for a federal apology. The National Sorry Day Committee organised many different events over the years including another of the National Museum’s Defining Moments, the 2000 Walk for Reconciliation across the Sydney Harbour Bridge. In 2007, the Labor Party under Kevin Rudd won the federal election and took office. It supported making a formal public apology to the victims of forced child removal, especially the Stolen Generations. The Apology was the first item of business when Parliament opened in 2008, and was witnessed by the thousands of people gathered in Canberra for the event and was broadcast all over the country. The Apology elicited a wide range of emotions amongst those affected. While few believed that it would completely erase the pain of the past, many felt that a vital first step in the healing process had begun. Through one direct act, the parliament has acknowledged the existence and the impacts of past policies and practices of forcibly removing Indigenous children from their families, and by doing so has paid respect to the Stolen Generations for their suffering and their loss, and for their resilience, and ultimately, for their dignity.